The cinema in George Street was built on the site of a former chapel in 1935. The Chapel of St George-the-Martyr (often referred to as a Church, but it was in fact a large chapel of ease) was situated on the north side of George Street immediately to the west of a lane that became known as St George’s Place. It was consecrated in 1850 to serve part of the large parish of St Mary Magdalen, and on census day 1851 had a congregation of about 125 in the morning and 175 in the evening. It was built in the Decorated Gothic style to the designs of P. Harrison, at a cost of £5500. In the early twentieth century the parish of St Mary Magdalen was reduced in size, so that the parish church was again able to serve the George Street area. St George’s is listed for the last time as a place of worship in Kelly’s Directory for 1919. From 1921 to 1935 the chapel building was used as the Ministry of Labour (men‘s department). 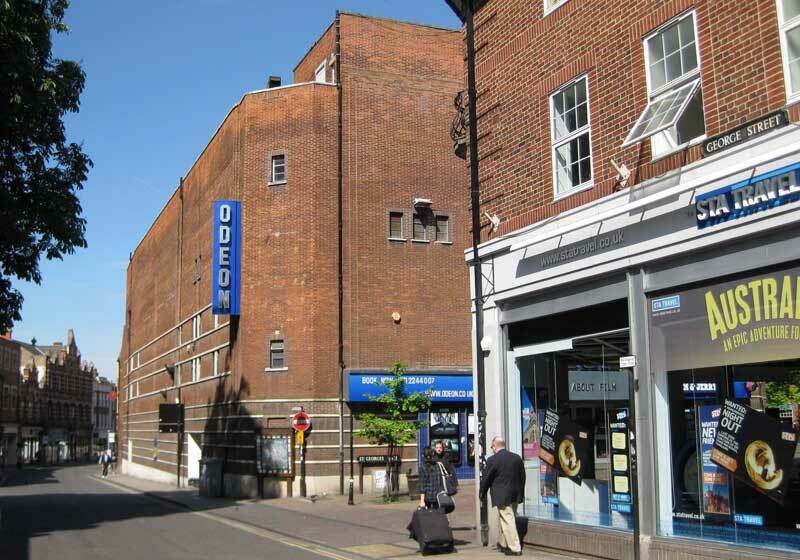 A new cinema is to be built on the site of the Employment Exchange in George Street by Union Cinemas Ltd. The new cinema will have a frontage of 140 feet to George Street. The old chapel was duly demolished, and the cinema opened in 1935. In April 1963 the auditorium of the Ritz was destroyed by fire, but it was reopened by Associated British Cinemas in October 1963 as the ABC. The ABC was split into three auditoria in 1975.